I used these 9006 for driving lights on my 2004 Dodge Ram 2500. Very easy installation. The color and brightness are exactly what I was looking for. These combined with my LED main headlights really give my old truck some new life. I used to have difficulty seeing at night but not anymore. Brite white look like OEM. And they don't flick went you start the car some of these tipe of lights flick went you start the car. What I can say I install the light bulb's and the work good also nice color they and bright almost look like OEM but better. Had to remove my HID because of VA inspection laws. My Trans Am had sealed beam headlights, was able to find a good pair of crystal clear lens aftermarket headlights that take a 9006 bulb. The bulbs that came with the aftermarket headlights was junk!! I couldn’t see at night and then in the rain, 3x worse. Found these LED bulbs, just a slight modification to the housing and they fit. I can actually see at night now. They are just about as good as my previous HID’s. Now I want to get all the stuff to replace my high beams. I LOVE them. 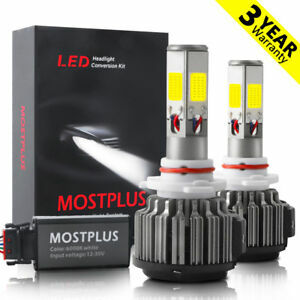 And the price, try and find a comparable bulb... DEFINITELY get these. I've never had great night vision and as I've gotten older it's been harder to see at night .These led headlights make it safe for me to drive at night without fear of the sudden fear you get when all of a sudden you can't see exactly where your going .My only worry now is blinding oncoming traffic with my high beams .The difference is remarkable .I change my headlights to led every time I buy a different car.I don't know how long they last because I've never had to change any of the three sets I've purchased .The oldest is 3+yrs and working great .This new set is the brightness yet.Do not hesitate to buy a set.They are as advertised .